Aiming for a casual work look? How about a simple stripe tee that never goes out of style? It has a carefree ease that allows you to effortlessly dress up or down. 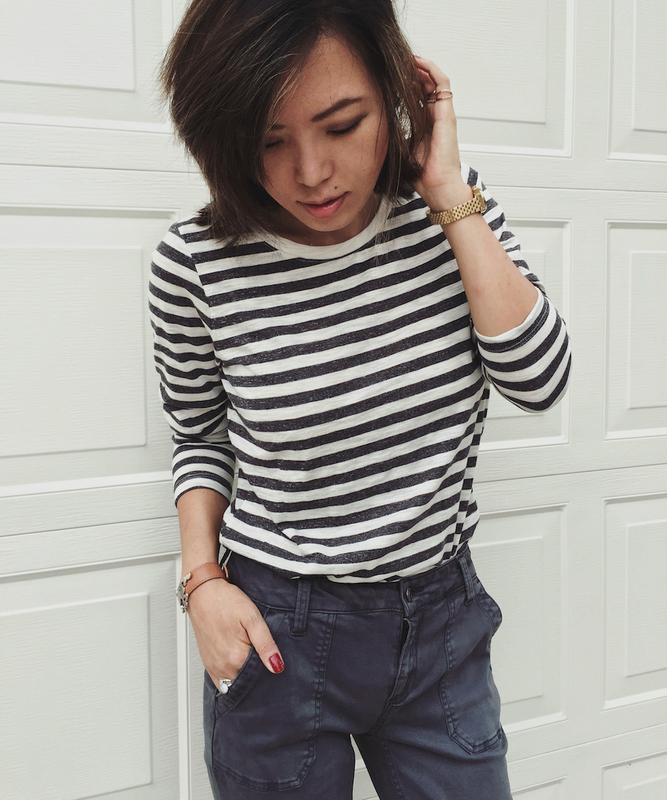 I favor denim pants most of the time but a stripe top pairs just as well with dressy trousers for a day at the office. For the crisp fall days, layer a blazer, cozy cardigan, or leather jacket (love this one). Take any basic outfit up a notch with accessories. Slip on a classic wrist watch, or have fun mixing & matching different rings. You can pop on a red nail color to add a touch of glam! These stripe tops look chic and feel comfortable. Wear them to work with a slim-fitting skirt, jeans or slacks. Stripes certainly never goes out of style. And they’re easy to combine. Love the big picture.